I have been MIA for the past two weeks. But today is a special day and I cannot resist a peek into this web space that has become my virtual kitchen. My blog turns two today. Two years back, I wouldn’t have believed that this blog would become an integral part of my life. But, it is today. There are so many people I am thankful for, G being the first and foremost. He has always been the gentle guiding force behind me, encouraging when I am down, and reminding to slow down when necessary. Not to forget that he is an excellent sous-chef and my guru in photography. Next, my friends and family, who never fail to encourage me with constructive feedback. Last, but definitely not the least, my blogger buddies, readers and visitors from whom I learn new things every single day. This forum has brought me in touch with some amazing personalities, whose friendships I will always cherish. I am thankful for your constant support and enthusiasm. This spontaneous blogging break that I am currently on, may extend for a few more weeks. Its more like a fuel-stop, to charge my brain and get the creative juices flowing once again. I will be back shortly. And I request you to bear with me while I am away. Hoping to see you all then! Congratulations Suganya !Hope to see many more recipes with excellent pics. Congrats on ur 2 yr journey! Wishing you to continue many more yrs like this! Collage work is sweet! Happy Birthday to your blog and may you have many more :) Congrats. I was going to comment anyway today, made your Vallarai Milagu Kuzhambu, tasted really nice when I tested - am looking forward to dinner. Suganya, always appreciate and admire the artistic creations you do with food. Congrats! MMHROTD !!! May you continue to blog for long with the same energy and passion that you have today. Never mind not being in action as long as you would get back soon. Happy Birthday and Happy New Year!You have been doing a good job in your blog. yay! Congratulations on the milestone and wishes for more to come. You have been an inspiration yourself to many of us. Happy Birthday Suganya!! Hoping to see many many more wonders of your recipes & photographs. Hey! Congrats on turning 2!!! I've always found your blog so fresh and have enjoyed trying out your recipes... Come back soon! congratulations!!! LOL abt the sous chef part, its a role my hubby is familiar with as well. I look forward to your future posts with your trademark luscious photographs! Congrats Suganya..looking fwd to your blogging again! Happy 2nd birthday Tasty Palettes!!!!! How wonderful - happy blog birthday to you!! I love your blog, you are definitely an inspiration! Congrats on the milestone Suganya! Congrats Sug and this blog is close to my heart and I make sure I read every post word by word :) Take care and come back with lots and lots of creative things! Congratulations on the milestone reached and wishing you many more happy blogging years ahead. Loved the collage. Congratulations - hope you enjoy your break and come back with some more recipes filled with flavour and health and accompanied by some of your delish pics. Congratulations on the second anniversary!Wish you many more years of this wonderful journey! Suganya, you did a fine job on this blog!!! Well done and may there be many more blogging years to come!!!! Happy blog birthday Suganya. I so appreciate your efforts. Your photography is gorgeous and your recipes all top notch. I for one am glad you have kept up with blogging and I look forward to many more years of your treasured recipes. Suganya, congratulations, and I for one am so happy you've been around with all these delicious recipes and gorgeous pictures. Wishing you many more such years to come! Happy anniversary to a beatiful blog... to you & your sweet guru! 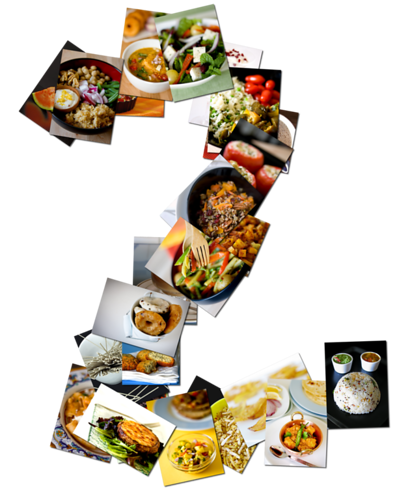 Congratulations Suganya!Really happy to see that your blog has turned two.. Happy birthday to TP. Congratulations on your 2nd blog anniversary. Looking forward to many more. I love your blog, the only problem is I can't figure out how to print your recipes. When I copy them on to a word doc, the grey back ground comes with it (which would make for a lot of wasted ink). Do you have any suggestions? Congratulations to this great milestone ...hope to see many more :)..
You've brought us all so much pleasure these past two years, Suganya. Congratulations! Congratulations!!!!!!!!! Its really a pleasure to see your blog! Keep up the great work you are doing!!!! the pictures are feast to the eyes! Congratulations Suganya, on your second blog birthday. Wish to see many more here as you continue with more cooking and mouth watering photography. Wishing you a very belated blog birthday Suganya! Enjoy the break! Congratulations Suganya on your second blog anniversary. I stumbled on your blog today when I was searching for some kitchen material. I'm so glad to have found it. Please do drop by when you are free. I also post recipes, though, photography of mine can never mtch yours. Hi Suganya,happy 2nd Anniversary to your blog. I wish to have many more years of success to your blog. Congratulations! I have enjoyed every recipe you have so carefully made and shared here - looking forward to many more! happy 2 yrs to ur blogging and wishing many more years to come! hi congratulations,u got nice blog..